German monitor makers HEDD — founded by industry veteran Klaus Heinz — have unveiled a new plug-in designed to solve one of the most challenging issues in loudspeaker design: phase linearisation. Many other monitor manufacturers use DSP solutions within their monitor designs for correcting frequency responses, but HEDD have handed this task off to software, harnessing the power of the host computer CPU (up to 192 kHz, 32bit), to improve the phase and frequency response, so that no additional AD/DA conversion is necessary. "When activating the HEDD Lineariser, transients are reproduced in perfect accuracy and the spatial qualities are being increased [sic]. Acoustic recordings will impress with their natural and intriguing character” claims HEDD CEO, Klaus Heinz. 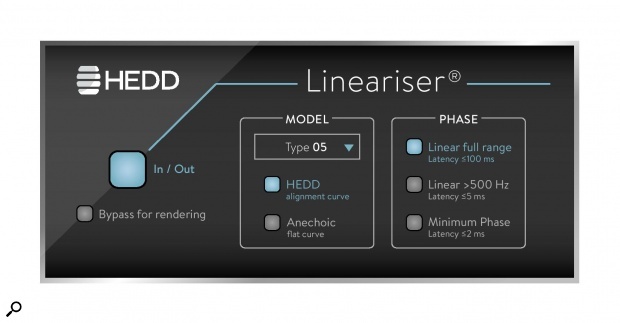 The new plug-in, called HEDD Lineariser, has been created specifically to complement HEDD loudspeakers and sits at the end of your mix-bus plug-in chain within your DAW. It can also be used in standalone mode for use with media players such as Spotify and iTunes. Users can choose between three phase settings (Linear Full Range, Linear above 500 Hz, Minimum Phase) and two frequency-related curves (HEDD Alignment, Anechoic flat).